By the grace of SrIman nArAyaNan, AzhwArs and AchAryas, and with the special blessing of nammAzhwAr, our trust/group took up the initiative of displaying the divine history of nammAzhwAr's journey to various kshEthrams during mughal invasion and his return to AzhwArthirunagari and re-establishment of temple norms. thiruvAimozhip piLLai, a great AchArya in our sampradhAyam, who is the Sishya of piLLai lOkAchArya and AchArya of maNavALa mAmunigaL was instrumental in bringing AzhwAr back to AzhwArthirunagari, bring the dhivya dhESam back to its glories and re-establishing the temple norms. It is important to highlight that, by the divine will of nammAzhwAr and thiruvAimozhip piLLai, the board was installed on an auspicious visAgam day (25th Dec 2016) which is the thirunakshathram for both of them. We first thank the dhEvasthAnam for allowing this gigantic display (flex board) to be placed inside the temple compound (right next to chithrai thEr (chariot)). We thank SrIvaishNavaSri krishNamAchAryar swamy for the initial draft of the whole history which was further decorated and condensed by us. We also thank SatakOpan swamy (thiruvAimozhip piLLai thiruvamSam), sthalaththAr of AzhwArthirunagari for his support in having this board installed. We also thank parakAlan swamy (parakAla rAmAnuja dhAsan, SrISailESa dhayApAthram ASramam) for his support and facilitation. 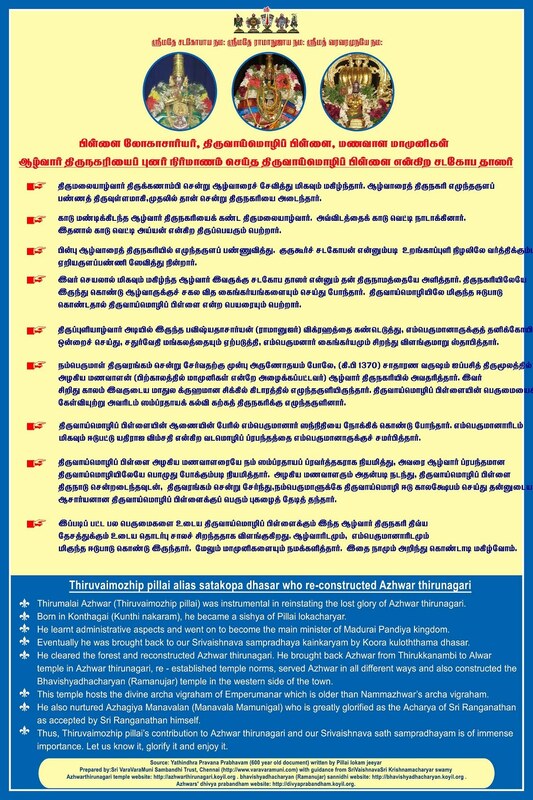 We thank Madura Digital Printers, Thirunelveli for their efforts in printing the flex with great dedication. We also thank SrI kaNNan, Mariappan digital Studio for his coordination efforts. We look forward to more such kainkaryams in the future.